The first step in setting up a new virtual server is to create a virtual hard disk. Virtual Server supports dynamically expanding virtual disks, which means that if you allocate a 4 GB partition but are only using 400 MB of this partition, the VHD file which contains the disk datat will only be about 400 MB rather than 4 GB. 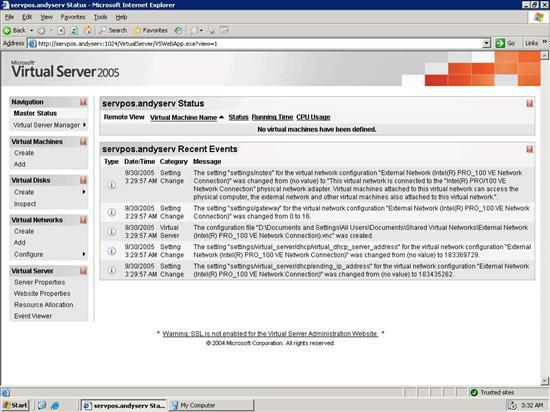 You may be wondering how something as complex as a remote server installation can be managed through a web interface. Luckily, the development team has come up with a very slick and easy-to-use solution to this problem. Despite all of the bad spyware-related press ActiveX has garnered over the years since its incorporation into Internet Explorer, ActiveX remains extremely useful for situations such as this. 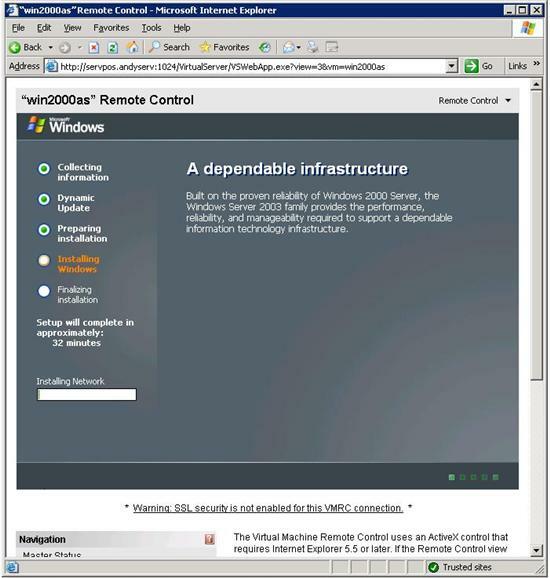 The Virtual Server administration site will ask you to install a digitally signed remote administration ActiveX control (see screenshot above) which functions much as the virtual display window Virtual PC users know and love. The difference here, of course, is that the virtual display runs over the network and directly in any Internet Explorer browser. Network administrators will be pleased to know that the remote administration site supports SSL 1 and 3, and sports a number of options to input SSL certificate information – meaning that all administrative site traffic, including that of the virtual display, is encrypted.